And I thought that’s something I’m always being told Birmingham is ahead of the game at. Take a read of Be Vocal – there you’ll find plenty of examples of tailored, local, community-based. Why doesn’t Birmingham take a lead here, put a marker down? Not to presume a superiority and show everyone how it’s done but, just like the Centre for Excellence in Media Practice does (to which I have a connection and think is fab), provide a resource point for excellence to be nurtured, developed and made useful. That’s why it’s a centre FOR, rather than OF. Now if you read Digital Britain it talks about Digital Participation in quite a specific way (and in doing so casts aside the much used term ‘media literacy‘). Participation would in effect be the responsibility of an organisation doing the equivalent job of Digital TV switchover and be charged with: “coordination and a clear and co-ordinated series of messages about the benefits [for being online]”. I’m thinking it’s gonna be a bit trickier than Digital TV switch-off which has an extremely compelling offer at its heart (“you won’t be able to watch TV as we’re going to switch off the analogue signal you know and love”). It would be one way in which those charged with the participation stuff as Digital Britain describes it knew what good stuff looked like. It would give them insight, new tools, compelling stories. In my mind it has a front door with a receptionist and long opening hours. I’m prepared to be swayed on that one but I’m not sure it should be tucked away on a campus (but I do think universities have a role here – at least one thinks this area worthy of study). 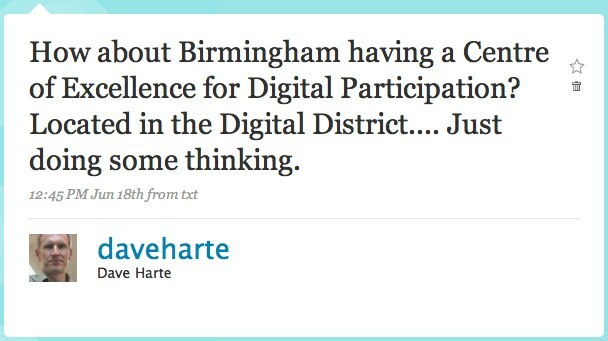 Birmingham needs a big front door to digital participation or it does up until the point we’ve got everyone online and participating. So I’ve had enough people now say, yeah, sounds interesting, let’s talk about it. I now plan to continue talking about it in a way that suggests everybody else has already agreed to it and it’ll be here before you know it. If you see me in the street I might mention it. Oh and funding – not a clue at present but we’ll see…. This entry was posted in social media and tagged digital britain, digital participation. Bookmark the permalink. To hit your five targets it needs to be five activities under one banner really as opposed to a big shop that contains them all. The activities call to different groups in different ways (but putting them under one banner even virtually makes sense to a funder). For me I’d like the physical space that embodies something like this to be approachable: definitely not tucked away on a campus but also not a “front door with a receptionist” either. Long opening hours yes. Perhaps you need a pub with wifi where the bar staff could help you out with things. So I’m talking about bar staff who are media savvy and well paid for it, not just well qualified and underpaid. >Long opening hours yes. Perhaps you need a pub with wifi where the bar staff could help you out with things. So I’m talking about bar staff who are media savvy and well paid for it, not just well qualified and underpaid. JH, you’re being amusing (ish), but I’m sure a “real social media cafe” where it’s a cafe/hang out, but the people in there really knew their stuff would be a nice way to keep the “door” open. I think that’s a different thing to the best practise/r&d side – but you’d want the same people to be involved with both. I really like the “show how this stuff works on the ground” target. On the train back from DBUC09 I was thinking about Birmingham being an ideal place for a digital startup incubator, where innovate startups are nurtured through their beginnings by knowledgeable staff. This could incorporate a cafe setting, as well as facilities for (un-)conferences. I’m thiking Fazeley Studios is already kinda set up for this. Dave: I think this is an excellent idea and I’d like to be involved more! I think your problem will be funding: are you up for drafting the grant application documents and slaving over them until they are tip-top? If you’d appreciate any help, let me know: I know a consultant who is just excellent at crafting these. Did I mention I wanted to volunteer?! Dave- let me throw an idea at this if I may. In the Mailbox, up on level 7 (opposite the BBC) you have the Virgin Media call centre. On the 1st floor inside there (flat ramps and lifts for wheelchairs, prams etc), they have 2 training rooms (16 computers, projector & screen, pa etc in each), plus an open area cafe and chill out zone, pool table, pinball machines and big fat comfy chairs. Virgin’s “Silver Surfer Club” programme is failing, possibly because they are targeting that market with broadband/phone sales in mind, rather than income from facility hire, ERDF/ESF/DCSF funding, matched with their own funding strands available, showing real outcomes rather than £’s. Perhaps that door could be opened? I’m sure I have regional contacts somewhere- I’ll have a look. Plus, it’s a good central, “cool” venue (man). Maybe there’s a partnership right there as a pilot, and then if it takes off, talk to Barclays Community Trust Fund (I haz contact definitely), continue the initiative, open a SocMed Cafe Venue (serving food, coffee etc) with open access wifi on New Street/ Bull Ring, (run it as a social enterprise? ), and maybe even use it as a springboard for creating a few jobs (add Business Link, UnLtd etc). Keep all the partners involved, and let it become a living breathing, engaging Socmed Centre of Excellence? If there were to be any ‘new’ centres or initiatives, I’d like to see them far removed from any ‘digital district’ and closer to the communities that really need the support.